It is impossible to know what will be revered down the road, but it is truly something to behold when you witness a film that you are just sure will be a future cult classic. From the detailed world to the crazy monologues, I get a good feeling that Snowpiercer will be just that. Snowpiercer, the latest film from Bong Joon-ho, is a rare breed: too smart to be a summer blockbuster, yet too fun to be a moody summer indie flick. So instead, it is a little bit of both, with fantastic results. Based on a graphic novel, Snowpiercer takes place in a post-apocalyptic world. After a solution to solve Global Warming fails, the Earth freezes over. A select few are given their own ark, in the form of a train that runs on a perpetual engine. Snowpiercer is able to explain this in a manner that is much more succinct than the normal blockbuster would. This is a film that truly knows how to pace itself. The train is organized like the Titanic, as the wealthiest take the front of the train, and the poor occupy the back. Like an old fashioned caste system, everybody is expected to stay in their pre-ordained position. Conditions are just right for a little rebellion, and that is exactly what happens as Curtis (Chris Evans) reluctantly leads a revolt against the upper class, who have been kidnapping children and feeding the poor with disgusting looking protein bars as the rich dine on steak and sushi. Snowpiercer is one of those films that doesn’t deserve to be as good as it is. Yet, it is by far the best action movie I have seen so far this summer. While American blockbusters have been trying so hard to appeal to audiences overseas (*cough* Transformers *cough*), maybe American filmmakers should instead pay attention to how filmmakers are making movies overseas. Snowpiercer is a masterclass exercise in action that doesn’t cloud character and story development. At its core, Snowpiercer is partially that classic story of “The One.” You know that story, because you have all seen Star Wars. That is when some random guy is chosen as the one who is going to save the world from the mess they are all in, even if that one person is going to spend the first two acts of the story complaining about being chosen. In stories like that, often, the other characters don’t mean as much. Everyone in Snowpiercer feels instrumental. This is less a story about “The One,” and more a challenging narrative about how society chooses its heroes. Yet, Chris Evans proves once again that he makes an awesome hero. Curtis is quiet for somebody who is selected to be a leader. Once he does talk, he delivers an incredibly memorable monologue, one that may or may not involve eating babies. 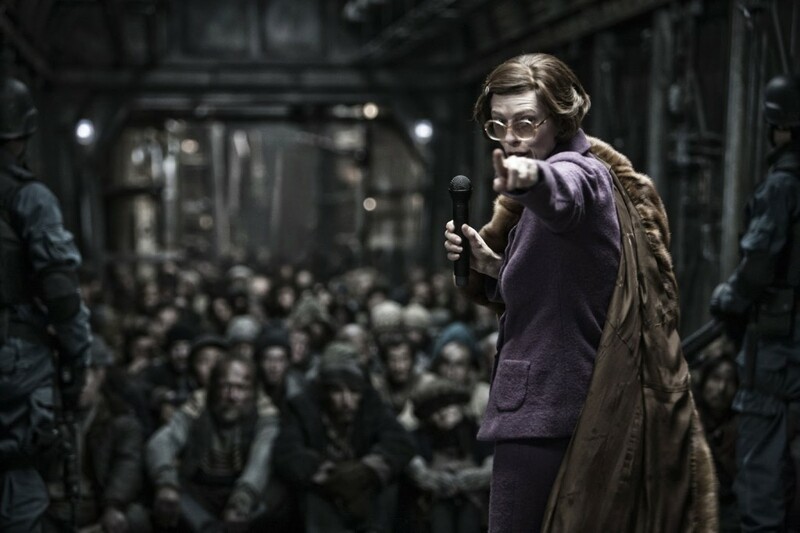 Snowpiercer has an impressive cast, with Tilda Swinton mainly stealing the show as the deranged but often very funny henchman. She works for Wilford, the train’s engineer and the supposedly benevolent leader. I could tell you who plays Wilford, or you could look it up on IMDB. However, the buildup to him is so well done and so suspenseful that it works even better if you don’t know. The less you know about Snowpiercer before seeing it, the better. So, maybe that means that reading this review is pointless. All I can say is that any blockbuster makes me think of class politics and the possible existence of God, and then throws in a night vision ninja fight on top of it, is good in my book. In a different era, people might have waited in line around the block just to get a glimpse of Snowpiercer. The difference between a good summer blockbuster director and a bad summer blockbuster director: a good summer blockbuster director pays attention to the world surrounding the characters, and makes it interesting before blowing it all up. A bad blockbuster director treats their world like a kid who just got a hold of a toy truck and some fireworks. Alison Pill might not be famous enough yet to merit “cameo” status. Still, there is a great cameo by Alison Pill in this as a propaganda-spurting school teacher. Prediction: One day, kids will be buying Wilford Industries shirts at Urban Outfitters. I have been watching a lot of really good TV lately. Whenever I watch a lot of really good TV, I tend to forget about movies. I tried to imagine Snowpiercer as a TV show. It would be a miniseries and each episode would focus on a different part of the train. Sure, it would be cool and incredibly in depth. However, maybe it would be too much detail, to the point of lingering. That is the good thing about film: you can get in, and then get out. A good director knows what details to focus on most in order to maximize the allotted two hours. Go to the movies, people. There are some good ones out there right now. This entry was posted in Uncategorized and tagged Bong Joon-Ho, Chris Evans, John Hurt, Movie Review, Octavia Spencer, Snowpiercer, Tilda Swinton on July 15, 2014 by ian0592.